In this article you’re going to learn a practical, step-by-step practice method on how to improve your jazz guitar improvisation. If you are starting from scratch and have never improvised before, or are more advanced but are struggling to sound convincing in your solos, then this article is for you. Get access to a print friendly eBook version of this article including all the lead sheets, diagrams, backing tracks and instructions. When people approach me for jazz guitar lessons online, the main challenge they face is being able to improvise effectively. I can really resonate with this. I studied for years with many gifted teachers and learnt a ton of tunes. Although I could comp well, play licks and knew all my scales and arpeggios, I had no idea how to improvise convincingly. What was going on? Answer: I didn’t have a clear practice method that I could use to build my improvisation skills and my jazz vocabulary. This is no surprise – jazz improvisation is a subject often not well taught or clearly communicated. Today you’re going to see an improvisation practice method I’ve assembled together over the years from various tips given to me from several teachers and also through my own observation. Personally, I’ve made a lot of progress with my improvisation using these technique, so I’m excited to share this with you. Note that this isn’t the only way to skin the cat (jazz cat? ), but if you’re struggling to get started or feeling stale in your improv this could be a good starting point for you. A big misconception about improvisation is that everything you play has to be a new idea on the spot, as if plucked from thin air. As Joe Pass outlines in this interview (fast forward to 0:47 in the video), improvisation is more the act of spontaneous music making, drawing on ideas and vocabulary you’ve already learnt or listened to, i.e. the raw materials stored in your subconscious mind. Jazz is very similar to having a conversation. A fluent English speaker is not consciously remembering what words to say, he is just drawing on those words stored in the subconscious mind and uses them for the purpose of communicating. So, to build your jazz vocabulary for improvisation you need to learn some jazz ‘words’ – i.e. licks, ideas and concepts. And the easiest place to learn them is from a recording. Every study of improvisation that I do directly relates to a specific recording that I’ve listened to. This gives you a wealth of raw material to draw on when it’s time to do a gig with the tune. For a great guide on how to find suitable recordings when you’re embarking on learning a new tune, check out this one by Steve Nixon, creator of freejazzlessons.com and pianolessonsonline.com. The tune we’re going to use for this article is So What by Miles Davis off his famous album Kind of Blue. If you’ve never listened to this album before, stop everything and check it out right now. This is the greatest selling jazz album of all time and it had a big impact on defining the genre. Hang on – where’s the guitarist?? For any tune you study, check out a few recordings and pick the one that really resonates to you – something that you feel would be worth the effort and interesting to you to devote quite a lot of time to. As an aside, at this point you should also learn and memorise the melody to the tune. We aren’t covering learning melody in this article, however this is a good step here as it can help provide a lot of good ideas for improv and can help your solo sound more cohesive with the tune. Even though this article is all about improvisation, the first thing I would do when approaching a tune is to not to go straight to the improv, but to learn the comping (chord changes) instead. Practicing comping is a good initial step to being more secure in your soloing as doing this helps your ear to get used to the changes. Aside from that, most of the time as a guitarist is not spent soloing but comping instead, so it’s important we have this base covered anyway. As you can see, the chords are pretty basic – there’s only two different chords – a rarity in jazz standards! Play along with the actual original recording of So What’, imagining that you are in the band and listening to what the soloists are doing. This is a technique many a great jazz player has used to build his comping and soloing skills. Knowing the chords will give you a good foundation for soloing later on. Next, it’s time to analyse the harmony i.e. the chord progression of So What, as we dig a little bit deeper into this tune. Let’s take a look. So What is a modal tune, which means that the key centre is on a mode rather than a major key. Scale patterns are just a basic foundation for improvisation. Contrary to what many people think, scales won’t actually help you much to improvise in a jazz style. This is just the framework, the ‘blank canvas’ for our painting. Now that we have these scales figured out over the chords, try the exercises below to get the fingerboard’s ‘lay of the land’ clearly in our minds. Take just one of the D Dorian box scale patterns provided above and, without a metronome or backing track, play up and down the scale. When you’re ready, change up one fret to Eb Dorian before returning to once again to D Dorian. Repeat the process but play the scale in a few of the places over the guitar neck using the box diagrams above, until you’re confident changing from D Dorian to Eb Dorian over the entire guitar neck. Repeat the process but this time experiment with different rhythms, starting on different degrees of the scale, and different melodic patterns. (For more ideas on using scales a bit more creatively in jazz, check out this post). The next step to establishing the foundation for our improvisation is to work out what the corresponding arpeggios for the chord progression are. Like scales, arpeggios are a good foundation for understanding the layout of the guitar neck, which is crucial for being able to improvise. Arpeggios also sound more jazzy than scales due to their angular melodic shape. Repeat process with all the different patterns on the neck, and learn to shift here and there between each pattern as you play over the backing track. Next, be a bit more creative with the arpeggios. Incorporate different rhythms, starting on different intervals, etc. Finally, once you’re very confident improvising with the arpeggios, combine with the scales and improvise with both scales and arpeggios. This is where many guitarists end up when they study jazz guitar improvisation. They have a clear understanding of scale choices, arpeggios, and the chord progression. And that’s it. And this is the whole problem! Whilst scales and arpeggios are essential to study, they serve only as a foundation for improvisation and a fallback. They are not an end in themselves. If you don’t study anything apart from scales and arpeggios, it might not sound like you are doing any wrong notes, but it will sound very vanilla flavoured – there will be very little jazz colouring in your solos. In the end, you don’t tend to consciously refer to scales and arpeggios very much whilst improvising jazz. Rather, the key ingredient to improvising jazz convincingly is by learning jazz vocabulary. Let’s cover this now. As I mentioned at the start of this article, improvising is all about learning the language of jazz (i.e. vocabulary) and then using it to communicate. It’s not consciously trying to invent your own words up on the spot – if you take this approach, it’s likely no one will be able to understand you! So how do we learn these ‘jazz words’? Through the process of transcription. Transcription is the means by which you can acquire new melodic ideas and increase your jazz vocabulary. It’s is the time honoured way for any jazz musician to incorporate new ideas into their playing and get some raw materials for spontaneous creative expression. At this point, listen to the recording and be on the lookout for some ideas and musical phrases (‘licks’) that appeal to you in the solos you hear. With the Transcribe! or similar software, highlight part of the sound file and play it over a few times and try to figure it out on guitar. Important transcribing tip: try not to slow the recording down if at all possible. See if you can transcribe at the full tempo of the recording. Only if it seems impossible to do this then slow it down to 75%. Try to wean yourself off using any ‘slow down’ functions the software may offer because it’s much better for your ears to be able to transcribe at full tempo (and it’s a lot faster to transcribe too). If you really struggle with transcribing, an alternative is using a transcription someone else has already done of the solo. In a way this is a much faster process as you can quickly find tabs for the lick that you’re interested in studying. However, you’ll find that when you do a transcription by ear you get much more attuned to the licks that appeal to you, as well as a more intimate understanding of the solo. It’s also excellent ear training. Do I need to transcribe the whole recording or solo? If time and interest permit you can do this. Learning and memorising a great jazz player’s solo is a good way to study how a great player structures their solos, how to create high points in the solo, and how a great soloist articulates their notes. However, this actually isn’t necessary for getting material for your own improvisation – in fact it could be a bit of a red herring in terms of our specific goal of learning to improvise. Some people think if they simply learn a full transcription all the way through they’ll be able to improvise, but that’s not necessarily the case – it very much depends on whether or not they have studied the vocabulary in the solo deeply enough. If there’s only a few licks that really stick out to you in the recording, just transcribe those – it won’t take too much time and you can quickly accumulate a wealth of jazz vocabulary by doing this. Put any licks you find in a licktionary (lick dictionary), either in a digital or paper form. I arrange my licktionary according to each recording I study. Memorise the lick until you can play it with your eyes closed. Once comfortable with this, start to vary the lick. Try different rhythms, starting on different beats, varying the notes etc, Eventually, ‘morph’ the lick into your own ideas that still feature some of the concepts of the original lick. If you start to accumulate a knowledge of licks and be able to apply them to tunes, you are much further along in your improvisation journey then you were before. However, this is another stage that many players arrive at but don’t get past. They become just ‘lick players’ without developing their own voice on their instrument. You now need to dig a little bit deeper into those licks that you’ve learnt. Let’s have a look at a few licks from the recording to illustrate the process. Shape of the line – is it ascending or descending? Does the lick have a scalic shape or a more angular arpeggio shape? Are there any passing tones or interesting notes? Any special techniques, e.g. slides, hammer ons etc? What is the rhythm doing? What beats does the lick start and end on? What rhythms are used throughout? What scale choices or arpeggios are used? How does the lick relate to the harmony? Let’s start with that smooth Miles Davis lick we learnt above. That’s right, we now have D melodic minor. The use of this alternative scale choice gives the lick a distinctive colour. So, another defining feature of this lick is targeting a 9th. Jazz horn players tend to use fourths a great deal in their solos, and so this is a very good concept for guitarists to practice and emulate (check out this article for more on this topic). Use of melodic minor scale over a im7 chord. Finishing a phrase on a descending fourth. Once you have a couple of concepts you’ve derived from a lick, put it in clear statements like this and record them in your licktionary below the lick you analysed. Let’s have a look at a couple of more licks now to see what else we can find on this recording. Use a Major 7 arpeggio a tone (2 frets) below a minor 7 chord. There are more interesting ideas contained in this lick. The concept statement here would be Diatonic Enclosures. The melody of a chart is an often under-utilised feature for getting new ideas into your soloing. By referring to the melody for ideas your solo can sound more cohesive and meaningful on a tune. The concept statement would be Using ideas from the tune’s melody or motifs. This first feature is one that’s easy to spot. You could practice this scale pattern and then incorporate it into your improvisation. You could also ignore the pitch and focus only on the rhythmic elements. As you can see, there’s a wealth of ideas you can extract from short musical phrases like this! For every jazz recording that you study, pick out a few licks like this, and then analyse and practice them in the manner outlined above. If you pick licks that really appeal to you, it means that you’ll build your style according to how you want to end up sounding. You don’t need very many new concepts to really transform your sound and start to create your own voice on the guitar. Just delve deep on a few concepts and work with them in the practice room. Take one of the concepts you’ve discovered and play that concept over the tune, e.g. Use of melodic minor scale over a im7 chord. Practice each concept until familiar with each separately. Then consciously combine two specific concepts, e.g the Cannonball Adderley descending sequence, and finishing a phrase on a descending fourth. Finally, combine all the concepts you’ve learned from the licks in several rounds over the backing track. Give yourself plenty of time to absorb the concepts in your playing. Have a go at writing your own licks based on the concepts, and then jam with these over the tune. Learning to improvise jazz guitar is a long play game. Rather than skimming over material, learning even just a few of these patterns really deeply can inject much more life, expression and authenticity into your solos. A limited but deep jazz vocabulary is far better than someone that can play a lot of licks but only insert them ‘cut & paste’ style. Now that we have the building blocks in place, it’s time to now take the scaffolding away. Music works best when it’s free of concept, and this especially true for improvisation. It’s time to call on that more powerful part of your mind, the subconscious, and let that do the leg work for you now. Remember what Joe Pass was saying about the subconscious mind? Now it’s time to put all of that into practice – Jedi style. Play on (many) rounds of the backing track but no longer consciously think of employing those licks and concepts we worked so hard on in the last stage. Take note of whether or not the ideas are coming out, but don’t worry about that too much. Just jam on a backing track for even half an hour on one tune. Perhaps record yourself now and then so you can listen back later to see how your progress is going. If you do this enough, your improvisation will start to sound less premeditated and much more natural. If you find that none of the ideas are coming through yet, go back to the previous section and spend a bit more time consciously working with the licks and the concepts we covered. Tip: With this form of practice, don’t just focus on the soloing. Each time you play for an extended amount on the backing track, play the melody a few times, do several rounds of soloing, and a bit of comping as well – as if the tune’s been called on stage. In fact, the ultimate way to practice this stuff is to actually go do a gig! It might feel like you’re not very good at this at first and you might feel a bit self-conscious with this form of practice. However, keep at it. There’s a tipping point where things start to gel and you no longer need to consciously think so much about what you’re doing. And that’s when you’re really playing jazz. Try not to get too wrapped up in the ideas and concepts. They are only a means to an end to reach a non conceptual state, where the magic starts to happen. Interestingly, after working on your improvisation for a while using the steps in this article, you might spontaneously start to come up with something that is completely original. Perhaps you are playing a gig and some ideas converge in a way that you’ve haven’t combined them before. Or entirely new ideas start to emerge. That’s the whole irony of all this. By putting strict limits in your practice and learning jazz vocabulary one piece at a time, it serves as a basis for being much more spontaneous when it counts. Something that might become a problem with this approach to jazz guitar improvisation is that you get stuck too long on one tune. It’s very important to build your repertoire of tunes so you can attend a gig or jam session. After a while of studying and practicing a few licks and concepts from a recording of a tune, let go and move on to the next tune to repeat the process on something new. Trust me – there is enough jazz vocabulary in a single Miles Davis solo for 6 months of study. But that’s not practical. Don’t get stuck, and don’t try to get everything perfect on your first tune. Just move on to new recordings, keep exploring, and keep growing your vocabulary. Every few tunes that you work on, make a recording and perhaps even show others for feedback. 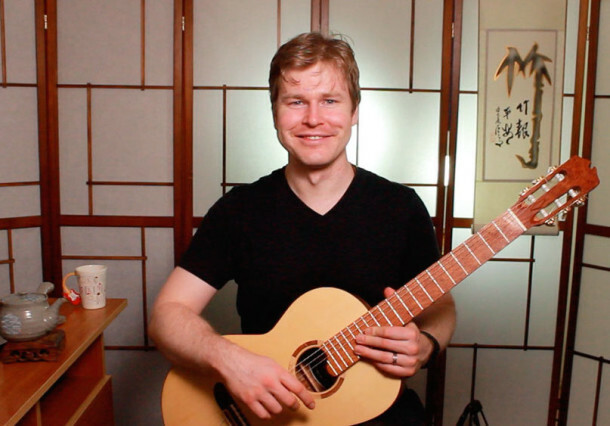 If you want to share recordings of your progress with improvisation, get access to the FretDojo Academy here, my online jazz guitar learning platform. Academy members often contribute video or audio recordings and it’s great to see the constructive feedback and appreciation that they receive from others. Essential Scale Patterns eBook:This ebook is one I put together featuring scale patterns based on the CAGED system for the main scale types you need to know. It’s a great reference for you to use when you’re working on the scale side of things. Transcribe: The software I use to make transcribing solos a breeze – an essential tool in the toolkit for any student of jazz. Real Book: If you need a legit chart to So What or other charts. Note that you shouldn’t just read charts from this book, they are just a reference to keep alongside a recording. Miles Davis – Kind Of Blue: The highest ever selling jazz album on iTunes. Handy PDF Download: Get access to a print friendly eBook version of this article including all the lead sheets, diagrams, backing tracks and instructions. Expression and communication – that’s the core purpose of improvisation. I believe no music can be more exciting, more moving and more expressive of our humanity than improvised music. Thanks for reading, but now it’s up to you. Stop reading – it’s time for you to get in the practice room and start working on all this stuff. Awesome! Thanks for sharing your knowledge! Thanks Graeme! Yes a lot people have been asking about this topic so it was a good one to focus on. Great article…….very in depth and revealing…I will study this and apply the concepts..Thanks ! Thanks Chuck – great to hear you are going to put these concepts into practice – let me know how you get on! Thanks for your kind words John, and glad to hear you enjoyed the article. Best of luck with everything. Musically speaking Greg, this is pure gold! Thanks for sharing your knowledge with the rest of us. wow Greg what a great lesson ! Thanks man !!! Didn;t know Aussie;s play guitar lol ! sorry Canadian humor . again thanks Rob ! hehe thanks Rob, yeah there are a few of us here Down Under! I’ve had this email in my mail box for a couple of days and decided to open it tonight. I’m so glad I did as there is a wealth of information regarding improvising over tunes. There are concepts here I hadn’t considered such as playing a major arpeggio a whole tone down from a Dorian Min 7 scale. A fine in depth study and easily explained. I am currently on vacation with no access to my guitar but reading through all this excellent material I can’t wait to get home and begin working through this. Thanks for all your work in putting this,together. Thanks very much Ralph – enjoy your vacation! I can only echo all the praise already heaped on this fantastic lesson by others. I noticed that you seem to play single lines with your fingers rather than a pick. Have you written anything about the whys and hows of this technique? I love the tone produced, but I can imagine that playing at faster tempos might be quite challenging with this approach. Any tips/guidance on this, perhaps in a future lesson, would be greatly appreciated. Thanks for all your generous sharing. GOD BLESSING FROM MOTHER AFRICA…..WISH YOU ALL THE BEST&LOT OF MIND REST…..QTHY…. Excellent article. I’m interested in other encores and even-please Greg. I love the short comping example near the beginning of this lesson. Do you have any more material which focuses on the development of comping skills in more depth? What kind of guitar are you using here? It looks really nice.